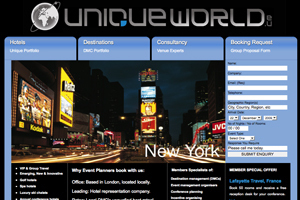 C&I consultancy Uniqueworld says increasing numbers of overseas hotels and DMCs are signing up as clients in a bid to target the UK market. The London-based consultancy said the fact that new international clients were targeting UK event buyers was a sign of confidence in the domestic market. Uniqueworld co-founder Andrew Harvey said: "In the past six months, we've expanded our client portfolio. Many hotels and destinations believe they can offer competitive and creative solutions for UK clients, especially in the current economic climate. Our ongoing strategy for 2010 is to continue to grow with emerging markets." Among the company's new DMC clients are Manhattan-based Briggs NYC, +Nine Zero of Turkey, La Fayette of France and US-based Access.